REGINA - A tough first period was the difference as the Pats fell 5-3 at home to the Moose Jaw Warriors on Friday night. The Warriors led 4-0 after the opening 20, outshooting Regina 21-8 in the process. The Pats responded in the second with a powerplay goal from Jesse Gabrielle, his fourth of the year, and it was 4-1 after two. In the third, Moose Jaw got the lead to 5-1 with Jayden Halbgewachs potted his 50th of the season. Josh Mahura would then score twice for the Pats, his 15th and 16th tallies of the year to make it a 5-3 game and that was the final score. The Pats outshot Moose Jaw 37-16 in the final 40 minutes and outscored them 3-1, but could not complete the comeback. Regina outshot the Warriors 45-37, the powerplay was two for four and the penalty kill one for three. Josh Mahura led the way with two goals and an assist while Ryan Kubic made 32 saves. - The Pats outshot Moose Jaw 37-16 and outscored them 3-1 in the final two periods. - Sam Steel has points in seven straight games with four goals and seven assists in that stretch. - Josh Mahura has four goals and six assists in his last four games. The Pats (24-14-0) are right back at it Saturday in Saskatoon against the Blades at 7 p.m. on 620 CKRM. Next home game is Wednesday against Saskatoon at 7 p.m. at the Brandt Centre. Tickets are available at reginapats.com and the Brandt Centre Box office. Full marks to the pats for sticking with it and having a better 40 minutes. But if you think this means the pats can compete with Moose Jaw you’re dreaming! Don’t take this as a shot at Pats. Moose Jaw looks really good. Hopefully playing at Brandt in may. Pats and Warriors in the Memorial Cup! Only one of the Titans showed up for the clash. The Pats cannot be included in the conversation of relevance in the WHL East. Not at all. The score flattered the Pats and probably would have been double digits if MJ hadn't taken their foot off the gas. Even in the 2nd and 3rd periods the Warriors were still far better and more dangerous, regardless of shots. Any series involving these two teams would be over in a quick four. To see the Pats come out so flat and unprepared to play is a definite black eye for the coaches. Maybe the new contract got them thinking they are all that. Steel and his line were terrible and they're the Pats best players. Their goaltending was average at best and not near good enough. Perhaps water has reached it's top level there, and not in a good way. This year once again this team has nobody to hold their own against the tough guys MJ has, and if they tried they got thrown around like a rag doll. You can easily see that some players both before and after the deadline have not bought in to the message of hard work. It surfaces occasionally but not every game. In trades you can get talent but not pride and work effort. With his work ethic while he was here Dubinsky put every Pats player out there last night to shame. This was not a "one off" game. It should be noted the Pats haven't won a single game this year against MJ and now you see why. Lots of fans left early and those who stayed to the end were really upset walking out of the building last night. Games like that are a bust when only one team shows up. Funny, they lose and there is nothing here until after midnight. Now it is 9:40 next morning and still only 1 post. Oops I forgot Mr. Weppler doesn't show up until late in the day when they lose. (: Moose Jaw ran all over them in the 1st period and cruised for the last 40 minutes just to let the Pats back in the game. If you get 23 shots in the last period and only score a couple of goals, what doe that tell you? 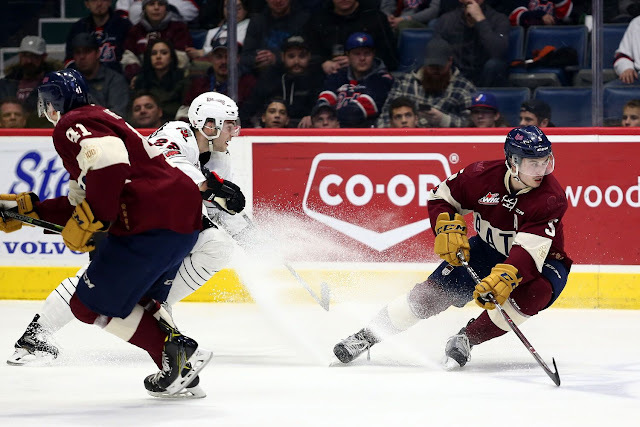 The Moose has a Superior team over Regina and the Pats will probably struggle to get a split over the Weak Saskatoon Blades on the week end. Go Moose Jaw ! they definitely can compete with moose jaw iam not dreaming iam awake lol! And that Folks is how you win the Eastern Division...very skilled Team that just keeps on coming similar to the Pats last year. Talent laden with a lot of speed and speed kills in this league. Congrats to Jayden Halbgewachs on his 50th!...amazing player and opportunistic which is how you get 50 in 47. Also a pat on the back to the Pats for just not rolling over after the 1st period...once they woke up it was a little more interesting but Warriors may have let off the peddle a bit too. Given that the Warriors have had the majority of their roster in place for this season and the Pats have had major changes it will be a different Pats Team going forward and in future meetings with the likes of the Warriors and Broncos, and they now know what it is going to take to complete with them. Can see Hajek getting more comfortable moving with the puck so is fitting in better every game, as is Hebig. JP juggled the lines a bit later in the game so will be interesting to see what his thoughts are over the next few games. Not quite sure Willms deserved 1st star ahead of his team mates...not a lot of difficult saves compared to Kubic. Also wondering if the League will review the spear to Mahura in the 3rd...ugly. Warriors are a very good team. Pats needed to play a full 60 minutes. Once the Pats matched the Warriors hustle and hard work with some physical play they were competitive. Stretch run is going to be fun. As usual anonymous trolls take cheap shots at Mr.Weppler and thump there chests about how superior there team is. Much like Sheen last night, jumping on and throwing punches when defenseless players are laying on the ice. Mr. Weppler always classy,insightful and intelligent comments, keep them coming. Time to face the facts Blades......I mean Pats. Thing that bugs me is why do people keep bringing up that the Pats have a free pass to the cup. Other teams could bid to host the cup just like the Pats did. They took a chance that they could be competitive and it didn't work our in their favor. But in saying that they made the changes to be competitive and time will tell how good they can be. Also for a Warrior team that is one the best teams they have ever iced and a pleasure to watch why have they had trouble filling their rink all year? Hope to see them a long with the Pats in the Memorial Cup. Go Pats! Fact...The Regina Pats are in the Memorial Cup. The Warriors have trouble filling their rink because the WHL bylaws forced them to build a venue that’s too big for their market. FACT! 30,000 people and a rink of over 5,000 compared to Regina with 200,000 people and a rink of 6,600 that has to get papered by Brandt to announce a sell out! You’re argument is flawed and immature. And really, who cares. I have seen this comment about Moose Jaw and attendance for warriors games a few times now and as a Moose Jaw resident I think those comments are misleading. I think the warriors draw about 3000 to 35000 average a game. That’s about 10% of the market place attending a game, for Jr hockey in a small market I think that is pretty solid. Mosaic place is probably a little too big for the market so there is a lot of empty seats, I also find attending games most fans sit higher up in the bowl then close to ice level giving the perception of a lot of empty seats on highlights or watching games on tv. Also weekend vs weekday games is a big difference and weather does have an effect on attendance at times, I am sure like most places. As the season progresses and hopefully the warriors continue playing at this level I do hope more people start attending games, but I don’t think attendance is an issue at all. Could the pats draw 10 % percent of their market to a game even if they had a rink that could hold 20000 plus? I know they had to pull out of the outdoor game due to lack of ticket sales. I am not trying to take a shot at the pats, I am just trying to put in perspective how hard it is to get about 10% of a market out to a hockey game. Disappointed in the warriors, I expected 10 lastnight, they are more than capable of that against the pats. Hey numb nuts! Start a Warriors Blog so Pats fans can sh*t on you. Nobody in here slams the Warriors in fact most people are quite complimentary of them and hope they win the Dub to have a double Sask Memorial cup rep but you show your true Moose Jaw lack of class. Nice work donkey! This attendance compared to population is just a bunch of crap. Do you know how many Reginans go to Moose Jaw for a game when the Pats aren't playing? Do you know how many people come from outside the city limits of Moose Jaw for a game? It is the same as Regina I am guessing. Don't give me this building is too big BS either. That building is packed for concerts and other events because I have been there for those things like Carrie Underwood, Alan Jackson and the Scotties. The bottom line is winning, but the 2nd thing is marketing. The Warriors have been terrible at marketing. They have this attitude that they are winning so why market. Iatradis and Nyhagen are terrible at what they do! People in Regina don't like some of the things about the organization. That is valid, but it isn't much different here. The biggest difference is deeper pockets. One other thing. Last nite's game was amazing for pre-game buzz and while MJ took it to Regina in the first two periods, it was the other way around in the final two. The Pats are going to be better moving forward. MJ thought they were home and clear last year before running into SC. Don't do that again or else it will be another long summer! I didn't realize there were 4 periods in last nights game. Regina will be okay once there complete lineup is healthy and they play together. It was fun to watch a good mj team last nite. Both teams I feel will deserve to be in the mem cup by seasons end. Pats will get 2nd wildcard and be swept by Moose Jaw in first round. Bank it. opinions opinions opinions lol it is the players in the end that will decide it! go pats go! Hey I'm a 20 year Pats season ticket holder and I'm hoping for Moose Jaw or Swift Current 100% so I can unload my inflated Memorial Cup tickets to them when they are in it. so what season ticket holder you say you re not a true fan, if you were you would be cheering on the one sure team in the memorial cup the pats.